AAAsports Championships - A Date For Your Diary! The most important date in the AAAsports calendar is quickly approaching, and we can't wait! The AAAsports Championships is a great Event for all our members to take part in, from Pre-School Displays, to Participation Events, to our Squad Members battling to become 2019 Champion - it's guaranteed to be a great day! All members across all our Classes are now starting to work on their Routines for the Event. In Trampoline, members will perform a set and voluntary routine for our Judges, whereas in Gymnastics, members will perform a Floor routine and Vault pass of their choice. Cheerleaders take to the Floor and showcase all they have learnt in their solo routines! Then on Sunday 23rd June, AAAsports will relocate to Rainton Meadows Arena for our Presentation Ceremony. Doors will open around 2:30pm which will be followed with every member receiving a medal and certificate on stage. But the fun doesn't stop there - we will also have a photo wall, games, prizes, highlights from the year, fireworks, special effects and a disco!! We have taken your feedback from the last Championships into account and to prevent increasing the cost, food will not be included in your ticket price. Alcohol is also not permitted at this Event and will not be served. AAAsports Hosts Sunderland Key Steps Competitions! AAAsports is involved in Gymnastics at all levels, and this term it was time for school pupils in Sunderland to perform as part of the Sunderland Key Steps Gymnastics competition! As an extra bonus, AAAsports Coaches were also on hand to give pupils the chance to try out activities they don't normally have in their school, including Trampolines and Bars! Well done to everyone who took part - if you'd like to learn more about what AAAsports can offer your school, click here! Floor & Vault 1 Results! Members of the AAAsports Gymnastics Squads travelled to Gateshead this weekend for the first round of the NEGA Floor & Vault competitions! Many Members competing in this event were competing for the very first time! Competing routines on floor and passes on vault, Members took on other competitors from across the North of England and achieved an excellent set of results, including several podium finishes, most notably in the U12 category with Angela finishing 6th, Lily in 5th, Louisa in 4th and Milly in 3rd! In the Boys U10 category, Lennox joined the girls on the podium and finished in 3rd place! Well done to everyone who took part and their Coaches - full results can be downloaded here! Our March Members of the Month have now been announced, and they're fantastic winners yet again! Our Participation Member of the Month is Rafaela! As a Member in our Adults Trampoline class, Rafaela has recently started working on her Front Somersaults and is showing great bravery and determination to achieve this new skill! Our Squad Member of the Month is Ciara! Training in our Intermediate Gymnastics Squad at the Louisa Centre, Ciara has recently achieved her Back Handspring on floor by herself and is now working towards her next competition this weekend, impressing our Coaches in the process! Well done to both Members! Congratulations go out to Performance Gymnastics Squad Members Abbie and Mya who took part in the Regional Grades competition in Newcastle last weekend. This was the first time either girl had competed in the Regional Grades event, despite having plenty of previous competition experience. The nerves clearly held out on Floor, with both girls achieving the same score of 12.45, which was the highest score in the whole event! Following her success on Floor, Mya then went on to claim 3rd overall! Well done to both girls and their Coaches! AAA Tigers Heading To Europe! In addition, the Junior B Level 5 Group Stunt placed 2nd, which when combined with their previous performances was enough to secure a space to represent the UK at the European Cheerleading Championships in Germany in July 2019! Amazing results! Congratulations to all AAAsports Members and their Coaches! If you're looking for fun during the Easter Holidays, look no further than AAA Days! Held at AAAsports Sunderland, we have a wide range of activities going on throughout the holidays to keep everyone entertained! If you're looking for fun, action packed days which are guaranteed to burn off energy, our Multi-Activity Days are ideal! Running every Monday and Thursday throughout the holidays, these are fun for everyone! For our Squad Members, we have a range of additional training opportunities too - just in time for competition season! Mondays will see additional DMT training, Wednesdays will have Trampoline and Gymnastics training while Thursdays will have Cheerleading training both weeks! Prices are just £20 for the first day and then £10 for every day thereafter across the holidays, and AAA Days run from 9am to 4pm every day (DMT & Cheer run from 1pm to 4pm). To book your space, log in to your myAAA account now! After a short delay in receiving the results, we are now pleased to confirm the results of the NDP Regional Trampoline Finals, held in Penrith on 3rd March! In the main NDP levels, our Trampoline Squad Members were competing for a place in the North of England team at the Regional Team Finals in Birmingham in June, with Members needing to achieve minimum scores in Trampoline, DMT and their conditioning routines. We're now happy to confirm that following the results of the event, Mya, Hannah and Isabel all secured spaces in the team by placing in the top 2 and achieving the minimum requirements! Well done girls! Whilst not competing to join the North of England team, we also had great success in the CDP levels with Isabelle placing 3rd, Sam placing 2nd and Emily placing 1st! Well done to everyone who competed and to their Coaches! To view the full results, visit our Results page! Congratulations to Hannah and Mia, who have been selected as the February Members of the Month! Mia has been selected as the Participation Member of the Month for her great progress within our classes. When joining our classes, Mia was shy and struggled to join in with the activities but now is confident in all rotations within each class and now performs Vault unaided! Hannah has been selected as the Squad Member of the Month, through hard work and dedication has now achieved a whole new set of skills and passes on DMT. Hannah has also transferred in to the Development Trampoline Squad and always supports her team Members. Congratulations to both Members, who both receive a AAAsports Goodie Bag! Congratulations to Dan, Ollie and Sam who competed in the National Schools Trampoline competition this weekend in Cannock, West Midlands! All 3 boys had qualified to this event through a Regional round held in Ashington and a Zonal round held in Belfast, competing in the final against the best competitors from across the UK! All 3 boys performed great routines and came out with some fantastic results! In the Y1-6 Novice Boys event, Sam performed two great routines to be crowned British Champion 2019 in his first year of competition! Meanwhile, in the Y1-6 Elite Boys event, Ollie secured a great 4th place finish while Dan performed an excellent set of routines and became the Y1-6 Elite Boys British Champion! Congratulations to all 3 boys and their Coaches, and a special thank you to all of the parents who have supported all of our Members through each round of these competitions! A fantastic weekend for Members of the Intermediate Gymnastics Squads, competing in their first ever Regional level competition at Catterick this weekend. Competing on both floor and vault, Members performed for the judges and the crowd at the busy event, combating nerves to gain some excellent results! All of our Members performed exceptionally, but special mentions to go Lily who placed 6th and Milly who placed 5th in the 12 & Under event, while Erin placed 3rd in the 10 & Under event! Congratulations to all of our Members who took part, their Coaches who helped achieve these fantastic results and the parents for their support throughout the event! AAAsports Hosts Free Open Day! It was great to see so many new faces in our Gym on Wednesday and Friday! On Wednesday 20th February, we opened our doors to Members of the public to come and try what AAAsports has to offer! Those who attended were able to experience Trampolining, Gymnastics, Cheerleading and Freestyle with our Qualified Coaches. Then on Friday 22nd, we invited Pre-Schoolers to come along and give Trampoline and Gymnastics a try! Both Events were a great success and we are looking forward to seeing lots of new faces in our Classes very soon! Results from the Zonal Schools Trampoline competition have now been released. Congratulations to everyone who took part, especially AAAsports Members Dan, Ollie and Sam who all progress to the National Schools Finals in March 2019! AAAsports To Launch Classes At Barnwell Academy! AAAsports are excited to announce the launch of our latest satellite location - Barnwell Academy in Penshaw! 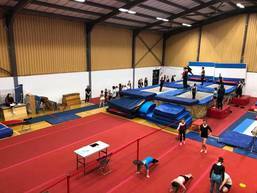 Starting 6th February 2019, AAAsports will be running Trampoline and Gymnastics classes at the location every Wednesday evening. Barnwell Academy is situated just minutes from the iconic Penshaw Monument, and will provide access to Trampoline and Gymnastics classes for new Members in the Penshaw, Shiney Row, Houghton-Le-Spring, Herrington and Washington. Members in our Barnwell Academy classes will benefit from the same high standards that AAAsports Members have become accustomed to, including our unique Skills Tracking facility, the AAAsports Academy and personal myAAA logins. If you'd like to join our classes at Barnwell, or any other AAAsports location, click here! AAAsports Shortlisted For National Award! AAAsports have been shortlisted for the British Gymnastics National Club of the Year Award! Celebrating the high quality classes we deliver and the dedication to our Members, this Award recognises the level of service that AAAsports are passionate about delivering to our Members. The judges also highlighted our commitment to our local community, our high level of inclusivity and the opportunities we provide for Members to gain qualifications and new experiences throughout the year. The shortlisting helps to celebrate previous successes at these Awards, having been previous winners of the National Education Award and National Inclusive Award, in addition to Coaches Susan Robertson and Jacob Reed winning National Volunteer Awards in previous years and Bradley Welsh being nominated this year in the Young Volunteer of the Year category! To read more about these exciting awards, click here!